Waterford FC are delighted to announce the signing of JJ Lunney for the 2019 season. Waterford FC are delighted to confirm that Brian Kerr, Daryl Murphy and Niall Quinn will be special guests at the Tribute to John O’Shea Gala Dinner. 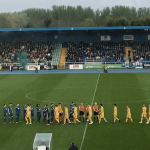 Dessie Hutchinson, Garry Comerford and John Martin scored as Waterford FC ended the season in style with a 4-1 win at home to Limerick in the RSC on Friday night. Waterford FC mid-term camp starts next Tuesday in the state-of-the-art WIT Arena. Waterford FC midfielder Bastien Hery has been named in the PFAI Premier Division Team of the Year. Waterford FC fell to a 3-1 defeat on the road as Shamrock Rovers secured third place in the Premier Division. It’s third versus fourth this Friday as Waterford FC make the trip to Tallaght Stadium to face Shamrock Rovers. 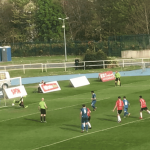 Dessie Hutchinson's late goal wasn't enough as Waterford FC fell to a 2-1 defeat at the hands of league champions Dundalk on Friday night at the RSC. Waterford FC are delighted to announce details of a mid-term camp this October.